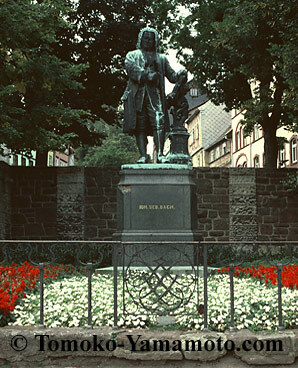 In 1993 Tomoko Yamamoto traveled to several small towns and cities in Germany to trace the life of Johann Sebastian Bach by photography. She went back to Eisenach in 1999 to take additional photographs. In 2004, she went back to Bach's country again, this time visiting Dresden, Leipzig, and Weissenfels with her cameras. These photo shoots form the basis of two Bach multimedia programs: Bach and His World and Bach in Weissenfels. Her slide show of Bach-related photographs was first given during performances in Baltimore Bach Fest 2000 at Second Presbyterian Church on January 23, 2000.